Prescot Flotation Bed Group with Fast Free Shipping! The Prescot Bed with Extra Underbed storage. Includes: headboard, footboard, side rails. (Does not include mattress). Mattresses sold separately. 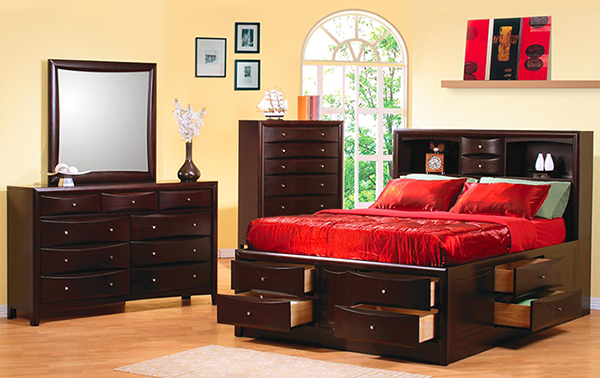 The Prescot Storage Bed has eight built-in storage drawers! A High bookcase style headboard has two more small felt-lined drawers. Add Extra storage to your room without adding extra space. 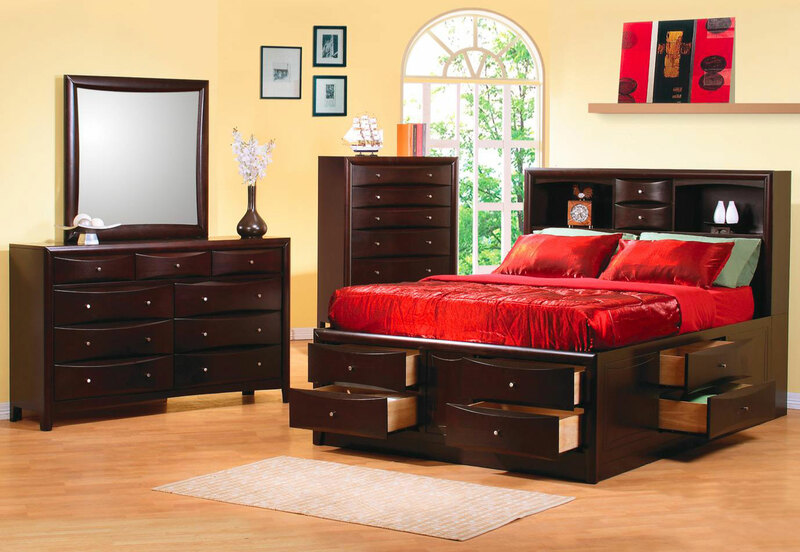 The Phoenix Bed has two drawers below each side of the bed, and four drawers in the footboard. Crafted from solid wood with maple veneer, finished in cappuccino with brushed nickel finished knobs. Includes: headboard, footboard, side rails. (Does not include mattress). Mattresses sold separately. The Prescot Flotation System includes: Storage Bed, 8" deep plush-top soft side mattress and 9" foundation for a complete modern flotation system. Available in Queen, King and Cal. King sizes. The Prescot Bed with Extra Underbed storage. Includes: headboard, footboard, side rails, Premium full depth 8" mattress and foundation for a complete flotation system.